The world is full of paradoxes and one amongst them is the conception about marriages, which says that they are made in heaven. If it is so, then the long lasting aspect should be something never to get worried for. Why then a seemingly perfect couple end up parting ways, that too after spending a long time of 12 years in companionship? Sadly and shockingly, the same story has been repeated and this time the victim is the world known basketball player, Tim Duncan. Tim, who is a popular name in the world of NBA owns a charming personality and his wife, Amy too is no less than a hot, sassy girl. This is not it, the couple also has spent 12 successful years of wedding together under one roof and has been blessed with two kids as well. But the recently announced split which was filed in March by Amy has been talk of the town. When the dirty game of divorce begins, there is no end of blame game and the couple too seems to be having their fingers in the same pie. The reason of divorce is stated 'cheating' by Tim and the file proposed by Amy has it that Tim was bisexual. Whereas, many birdies have it that the cheating game turned into more of a revenge game which was kickstarted by Amy, who was romantically involved with one of Tim's friend, who was also the couple's trainer. The strange or fishy thing to notice here is that the so called friend of Tim has been shacking up with the couple since the time of their wedding. Quite a brow-raising fact but may be was under the wraps since Tim might not have wanted to wash his dirty linen in public. Sources also have it that Tim was taken aback when Amy filed the divorce petition as he himself was waiting to do so. The basketball masterstroke Man, had hired investigators to keep a check on his wife and her alliances. What was revealed is still under the wraps and the whole story is pretty baffling to decode. Tim Duncan is an American, basketball player, who is retired now. His entire career of 19 years was played with San Antonio Spurs and National Basketball Association (NBA). This super talented man is five times NBA champ, two times NBA MVP, Three times NBA finals MVP and also NBA All-star Game NVP. 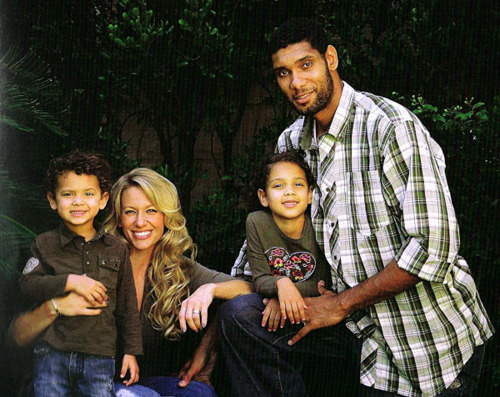 Amy Duncan is wife of Tim Duncan.